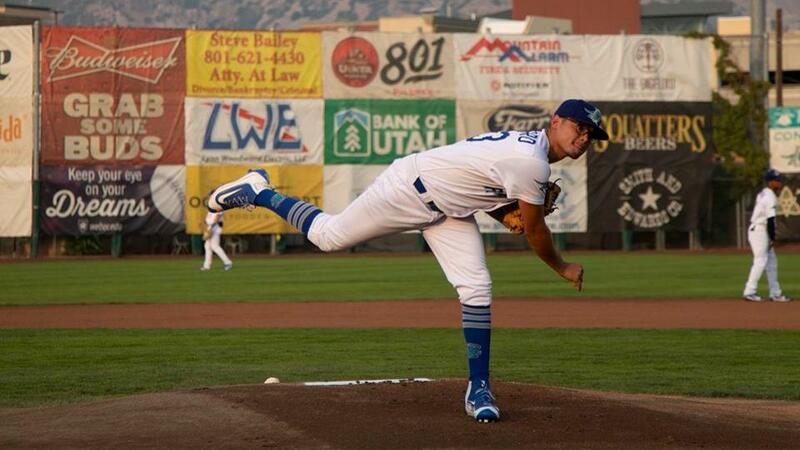 For eight and two-third innings Tuesday night, the Ogden Raptors pitching staff was in full control. Orlandy Navarro, Connor Mitchell and Justin Bruihl held the host Orem Owlz down on four hits, one walk and no runs until there were two down in the ninth. The Owlz ended up scoring on a double to break up the shutout, but the Raptors held on for a 4-1 victory to complete a four-game sweep over their rivals. While not firing on all cylinders, Ogden's offense did just enough to plate the runs they needed. The first run scored in the second inning on a soaring pop fly to shallow right that dropped behind incoming right fielder Reyneldy Rosario, allowing Dillon Paulson to score from third base with one out. The Raptors added another in the fourth. Niko Hulsizer lined a single to center with two down, and Marco Hernandez lifted a fly ball down the right field line. Rosario sprinted toward the corner and leaped, but the ball landed past him in fair territory and Hulsizer scored easily. In the fifth, Jeremy Arocho wreaked havoc with his legs. After drawing a leadoff walk, Arocho stole second base and then took third on a wild pitch. Paulson hammered a drive to center that was run down near the warning track, and Arocho tagged and scored from third base. Ogden plated their final run in the ninth on a mirror image of the fourth-inning tally. With two down, Marcus Chiu reached on a walk. Paulson then hit a fly ball down the left field line. The left fielder, Johan Sala, leaped toward the foul line only to see the ball sail over his head and hit inside the chalk as Chiu came around the bases. On defense, Ogden turned in their second errorless game of the series to back up the strong pitching. Hulsizer turned in the play of the night by chasing down a fly ball and making the catch reaching above his head while sprinting toward the right-field wall in the sixth. Navarro gave up three hits in his five innings. The first and third, both off the bat of Erven Roper, were bloop singles placed just right. The only hard-hit single he allowed was to Kevin Maitain leading off the fourth, after which he stranded the runner. Navarro struck out four and didn't walk anyone to earn his first win with the Raptors. The first reliever, Mitchell, struck out three and pitched perfect frames in the sixth and seventh. Bruihl came on for the eighth and walked the second hitter before a bouncing ball found a hole on the right side to put two Orem runners on at the same time for the first time all night. A flyout and strikeout ended that inning, and Bruihl retired the first two batters in the ninth. Connor Fitzsimons then swung and missed at strike three, but the ball got behind the plate and he reached on a wild pitch to keep the game going. David Clawson capitalized by driving the ball to deep center for a double, ending the Raptors' chance for a third shutout win in 2018, but that was all the Owlz put up. The Raptors' sweep is only their second on the road all season, after a two-game sweep at Orem in late-June. Ogden returns home to kick off their final regular-season homestand on Wednesday. The Raptors will host Idaho Falls for two and then Grand Junction for a pair before taking Sunday off. All games are scheduled to start at 6:30 PM.